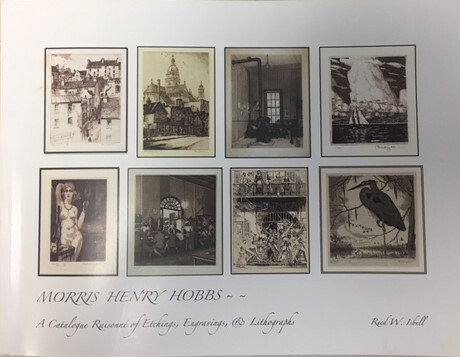 The Morris Henry Hobbs – A Catalogue Raisonne of Etchings, Engravings and Lithographs by Reed W. Isbell is now available. The artistic story of this well-known Chicago and New Orleans print maker makes for a fascinating read and a valuable resource material. Even though Hobbs also produced oils and watercolors, the book focuses on the prints that he created during his long career. Hobbs grew up in Illinois and after service in WWI (where he lost his hearing), he lived in Toledo, Chicago and New Orleans. While there are prints in the book representing his Toledo years, the primary emphasis is on his work in Chicago and New Orleans. Trained as an architect, Hobbs moved to Chicago in 1927 to work with a prominent architectural firm. Unfortunately, the owners of the firm died in a tragic boating accident and by 1930, Hobbs was on his own trying to make a living with his art. He had a studio in the Tree Studios Building at 4 East Ohio -across the hall from Henry and Charles Rosenthal. He was very active during this period and produced many etchings and drypoints of Chicago and European cities that he had visited. His representational style work was highly acclaimed in exhibitions that he entered as well as being selected for inclusion in several of the “Fine Prints of the Year” books. Hobbs is well known for his sympathetic and elegant treatment of the female form. “The Nudes” section of this Catalogue Raisonne covers 40 pages of the 200 page book. Included are the “Postage Stamp” size etchings that he produced for Associated American Artists. His AAA etchings proved to be some of the most popular distributed by the group – especially after the US Post Office balked at sending out the promotional mailings. One can see why. They are beautiful representations of the human form and through the bearing and expressions of the models convey many different personalities. Hobbs was a master at this genre. By 1938 Morris Henry Hobbs decided that he would like a change of scenery and artistic challenge – so he went to visit New Orleans. He never left. His “New Orleans” series took him 10 years to produce and it captures the feel and the architecture of the Vieux Carre like no other. On this first visit, Hobbs realized that the “renovation” that was beginning at that time threatened the character and ambiance of this unique city. The book contains etchings of many of the famous buildings of New Orleans but also includes many of Hobbs’ etchings of the back streets, the old houses, the Mardi Gras events, and others that give a glimpse of what life must have been like in the city in the 1930’s and 1940’s. Once in New Orleans, Hobbs immersed himself in the local artistic community. In fact, he was the founder and first President of the Louisiana Society of Etchers. He continued to win accolades for his work. By the late 1940’s Hobbs and his wife, Judy, bought a house in Mandeville, Louisiana on the north shore of Lake Pontchartrain. Even though his print making decreased, he was very active in another interest – tropical Bromeliads. He was the founder of the Louisiana Bromeliad Society. He spent a number of years painting a series of watercolors depicting Bromeliads and wild birds. Several are represented in the book. This Catalogue Raisonne was researched and written by Reed Isbell-Hobbs – the daughter-in-law of Morris Henry Hobbs. After the death of MHH’s son, William, the responsibility for the Hobbs artistic legacy was passed on to her. She has taken her role seriously and spent ten years to produce this attractive, well-written and informative book. It is a “must have” in the art library of all lovers of representational prints. The book can be purchased by sending a check for $50 to R. Isbell, P.O. Box 206, McLean, VA 22101-0206. Please include your address. The price includes postage. So glad to see Hobbes’ work receiving the attention he’s due! I agree. The book does a great job of showing the full range of his work.